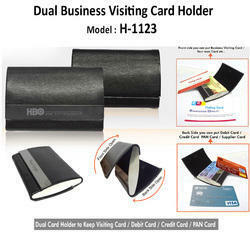 Our firm is involved in offering an outstanding range of Visiting Card Holder for our esteemed customers. Size: L 6" x H 4"
Card Holder with loop + 1 bank note compartment , 3 card slot, 1 coin pkt. We are offering Rajasthani Key and Card Holder to our clients. This card holder is made of high quality sheepnappa leather. It has 4 credit card slots and a facility to hold visiting cards. We are offering Card Cover to our client.